The CALIFORNIA AIR TOOLS SP-9421 Ultra Quiet & Oil-Free Air Compressor Pump/Motor is designed to be one of the quietest in the industry having only 70 decibels of sound. The new SP-9421 motor has a new valve plate design made with Swedish reed valves which improves air flow, reduces wear and decrease the sound level. 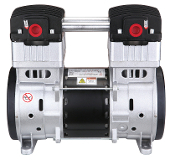 The powerful 2.0 HP motor operates at only 1680 RPM creating less noise and less wear. The SP-9421 pump/motor has a Oil-Free Dual Piston pump designed to have a life cycle of 3000 Plus hours before repair.